Tubeless Insulin Pump Market size was valued over USD 350 million in 2016 and is expected to witness more than 25% CAGR from 2017 to 2024. Escalating prevalence of diabetes and obesity, growing geriatric population and technological advances in tubeless insulin delivery should drive the market size. According to WHO, diabetes will be the among the leading causes of death by 2030. These factors will prominently intensify the global usage of tubeless insulin pump over the forecast period. Lifestyle changes shall continue to impact obesity prevalence in western as well as non-western population. Cultural switch from native diets to high fatty diet should increase the propensity to get affected by diabetes and obesity surging up demand for the tubeless insulin pump. Technological advances in the field of glucose monitoring devices and tubeless insulin pump should stimulate business growth over the forecast years. Tubeless insulin pump is convenient, portable and effective in achieving better blood glucose level control, eliminating the need for daily insulin injection doses. Devices such as Omnipod is a novel tubeless insulin pump which displays blood glucose levels, schedules insulin delivery and calculates optimal insulin dosage based on food database. Increased adoption of non-invasive transdermal insulin delivery systems has improved patient compliance for diabetes treatment. Use of microneedles and micro-emulsions improves permeation of insulin through transdermal route. Other effective routes of insulin administration such as oral, buccal, nasal is explored as alternative non-invasive modes of delivery. High long-term cost associated with use of tubeless insulin pump hampers the market growth. Compliance to therapy reduces over the time owing to significant cost associated with its daily use. Limited reimbursement coverage should further restrain the industry expansion over forecast years. The tubeless insulin pump comprises of a pod/patch, remote and other accessories such as reservoirs and batteries. The Pod/patch market accounted for largest market share in 2016 and is forecast to witness considerable growth over the forecast years. Improvement in pod’s size and functions will drive tubeless insulin pump demand over the coming years. Remote segment is set to witness significant growth, owing to its vital role in insulin delivery process. The need to regularly change a remote is spurring demand for these devices. Incremental innovation to design remote which can control pump functions from distant location will accelerate its usage over the coming years. E-commerce held the largest market share in 2016 and will continue to be the biggest distribution channel for tubeless insulin pump over the forecast period. Its popularity should grow over coming years owing to rapid penetration of internet and ease of procurement from remote locations, the e-commerce will be the most popular channel for purchase of tubeless insulin pump. Hospitals has been the most popular distribution channel for insulin delivery and diabetic patient care. Many hospitals have started offering tubeless insulin pump to in-patient as well as out-patients stimulating the business growth over the forecast years. U.S. tubeless insulin pump market accounted for largest regional share in 2016. Diabetes prevalence is escalating due to increasing aging population, rapid urbanization and increasing cases of obesity due to lack of physical inactivity. The anticipated rising demand for tubeless insulin pump should strongly drive regional business growth. Germany will be the biggest market followed by other European countries such as France. However, UK market is forecasted to grow with highest CAGR of above 25% during the forecast period. APAC should witness considerable growth over the coming years. Rising awareness for diabetes care, improving economic conditions and growing adoption for technologically advanced insulin products should accelerate regional business growth. 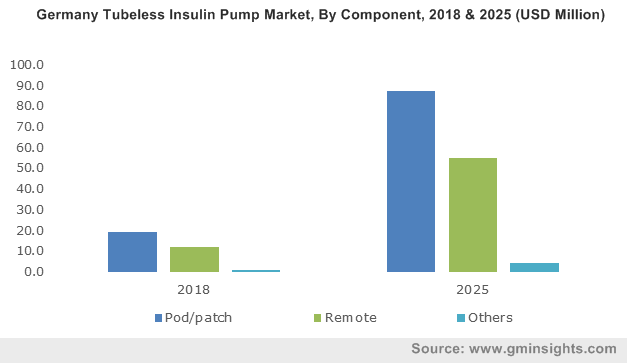 Some of the major players in global tubeless insulin pump market are Insulet Corporation, Johnson & Johnson, Medtrum Technologies, Cellnova, Roche Holdings, Spring Health Solutions, Debiotech, CeQur, Valeritas Holding and Abbott Diabetes Care. Insulet is one of the oldest company that offered the first ever tubeless insulin pump, omnipod. Currently, it holds the largest market share and is anticipated to dominate industry share over the forecasts period. It should face intense competition from emerging companies in tubeless insulin pump market such as Johnson & Johnson and Abbott. Tubeless insulin pump industry is relatively new compared to the traditional tubed insulin pump industry. Only a handful of companies offered tubeless insulin pump till 2016 and many are in process to launch their version of innovative insulin pump in the near future. The industry is expected to undergo significant expansion over next 6-7 years. There have hardly been any product launches after the launch of first tubeless insulin pump by Insulet Corporation. Recently, many companies have started launching their innovative insulin products in the market. Several major industry players are trying to exploit the lucrative market by adopting business consolidation strategies.